PM Modi accused the Congress of hatching a conspiracy to destabilise the country and "demoralise" its soldiers. 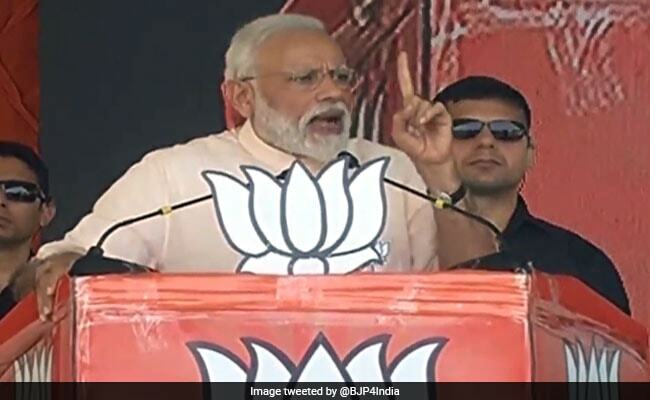 Seeking to turn the heat on the Congress over its poll promise of reviewing the AFSPA, Prime Minister Narendra Modi on Wednesday said the assurance "toys with national security" and termed the opposition party's manifesto a "document of Pakistan's conspiracies". Addressing a rally in the city ahead of next week's polling, he accused the Congress of hatching a conspiracy to destabilise the country and "demoralise" its soldiers. PM Modi termed the coming together of opposition parties against the ruling BJP and its allies "maha milavat" (grand adulteration) and said it would boost Naxal activities if they came to power as he blasted the Congress over its promise to scrap the sedition law. The prime minister also asked Nationalist Congress Party (NCP) chief Sharad Pawar, a former defence minister, if he agreed with the Congress's manifesto, particularly on the issue of reviewing the Armed Forces (Special Powers) Act (AFSPA), which gives sweeping powers to security forces in troubled areas. Without naming anyone, PM Modi alleged that NCP leaders "were unable to sleep" as their "sleep was jailed in Delhi's Tihar". "You can see the Congress hatching a conspiracy to destabilise the country. They have a habit, either they grab everything or create confusion," PM Modi told the rally. "Their manifesto toys with national security. The Congress's manifesto is a document of Pakistan''s conspiracies. It is a conspiracy to demoralise the soldiers." "The Congress's manifesto is a document of conspiracy by those who gave the slogan of ''Bharat tere tukde honge'' (calling for India's dismemberment)," he added. The Prime Minister said the security forces were "relentlessly" combating Naxalism and the days of Maoists, who had spread violence in Maharashtra, were "numbered". Naxalism would get a boost if those engaged in "maha milavat" came back to power, he warned. He also said the Maharashtra government had acted against "Urban Naxals". Referring to the Congress's poll assurance of repealing the sedition law, Modi said the opposition party had promised that "there will be no sedition case if any urban Naxalite is caught in anti-national activities". "Tell me if the Congress and the NCP are doing the right thing. Should the sedition law go? Should those who want to disintegrate (the country) get a free licence?," he asked the crowd. Attacking the NCP, PM Modi said its leaders were "unable to sleep these days". Because their sleep is there inside Delhi's Tihar Jail. They are afraid that the one who is inside may reveal something. They are worried. And that day is not far when everything will come out in the open." Though the prime minister did not name anyone, it is believed that he was referring to corporate lobbyist Deepak Talwar's arrest earlier this year for his alleged involvement in several aviation deals.